As Rue McClanahan once said: "Cruelty is one fashion statement we can all do without." Psychologist/Comedian Murray Banks took it one step further with "No one in the world needs a mink coat but a mink." Ok, not exactly a mic drop moment but humor me here -- it's been a long week! 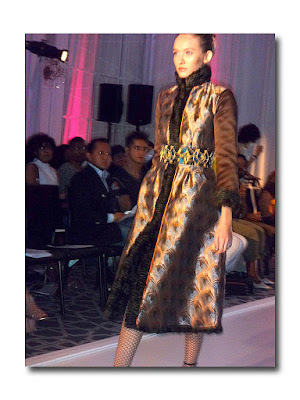 Anna Tagliabue, designer of Pelush New York, known for its luxury faux fur, would no doubt agree. Her latest collection of PETA approved, summer - cold storage - free apparel walked the runway at the Affinia Manhattan Hotel's ballroom yesterday afternoon in their debut fashion show. It was a pampered, cosseted, if slightly skittish audience of dogs and their owners. Like a typical New Yorker wishing to make his presence known, an impatient little yippy "purse rat" barked right on cue as the lights dimmed and the show commenced. 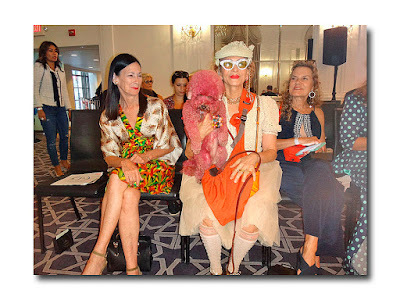 I had previously attended a Pelush trunk show and was familiar with the brand's message of "Re-Faux-lution" (as well as the fact that everyone brings their four-legged friend) however it was the high-end nature and design aesthetic that really made my (real fur loving) tail wag. 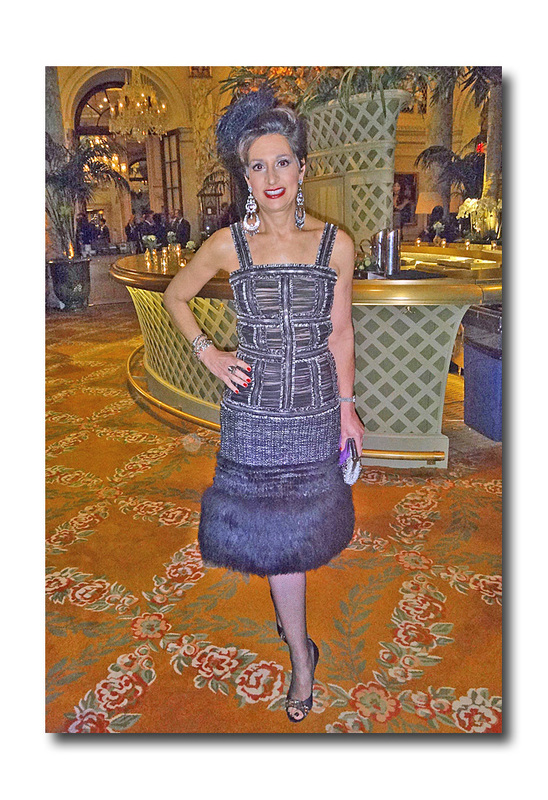 Born and raised in Milan, Tagliabue a former buyer, personal shopper and stylist for Fendi and Prada, created the Pelush concept to reposition and transform the boundaries of the faux fur world. Sourcing and selecting only the finest Italian fabrics and fibers, one of a kind linings, trims, handmade crochet and jewel appliqués, all serve to make these coats truly distinctive, personal and elegant. The runway show did not disappoint as Tagliabue has continued to refine her designs with ever more bespoke embellishments along with an interesting mixing of textiles and textures. The models, walking in a very dramatically pink and blue lit room, accompanied by a "Fantasia"-like score, were styled with fabulous Fogal and Wolford leg wear, unique/sparkly/ mostly vertiginous footwear, and coordinating faux fur headwear. 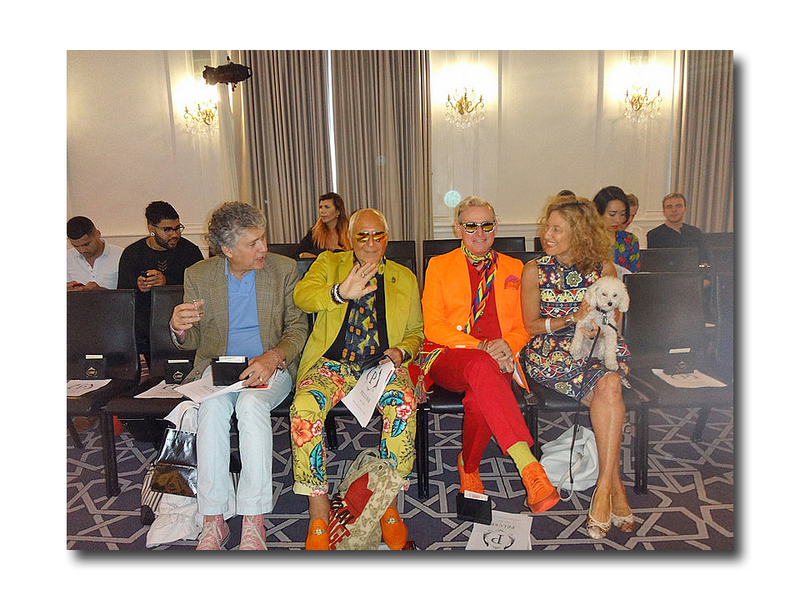 Of the 31 looks, there were only a handful that I could not see myself wearing, mostly due to their color palette. As the designer is a fair skinned redhead many of the olive green, brown, pale pink palette of "fox," "mink" and "broadtail" would better suit someone of her coloring, which I couldn't help noticing, included several of the models. There was basically something here for everyone from the "fun" fur more casual coats, the dressier jeweled "evening" coats of broadtail or chinchilla, a tailored jacket worn with jeans, a "Renaissance," and a "Couture dream" gown both of lace and fairy tale-esque, a dress of "bronze feather bark fur" and one of "Opaline Poodle,"as well as a few capelets of broadtail or chinchilla. At least two of the designs were reversible which I always love. One chocolate broadtail was named "Political Statement" (do we really need our coats becoming political too?) 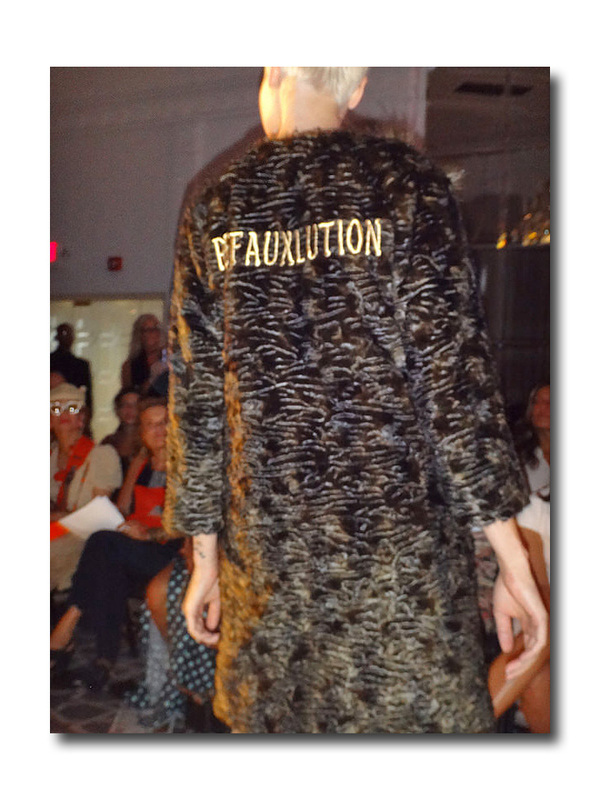 has "Re-faux-lution" stitched on the back in gold thread. Assemblage artist Purely Patricia with her purple pooch (say that five times fast! ); Branding Expert Amy Rosi; and show coordinator/ PR rep/former supermodel Debbie Dickinson who managed to keep her cool despite hearing from a press photographer that many of his cohorts had gone AWOL, and were currently waiting cluelessly at an erroneous address listed by the CFDA. At the end of the formal show, models and staff donned white Pelush tees emblazoned with anti-animal cruelty hashtags such as "#Join the Re-faux-lution," "#Go Faux," "#Be Kind to Animals," "#Fur-Bidden," "#Protect Animals," "#Compassion is Fashion," "#Friend and Faux" -- examples of which were featured on a giveaway table. Tagliabue, who finally emerged after many musical crescendos avec chien, bien sur, recently went vegan IRL. 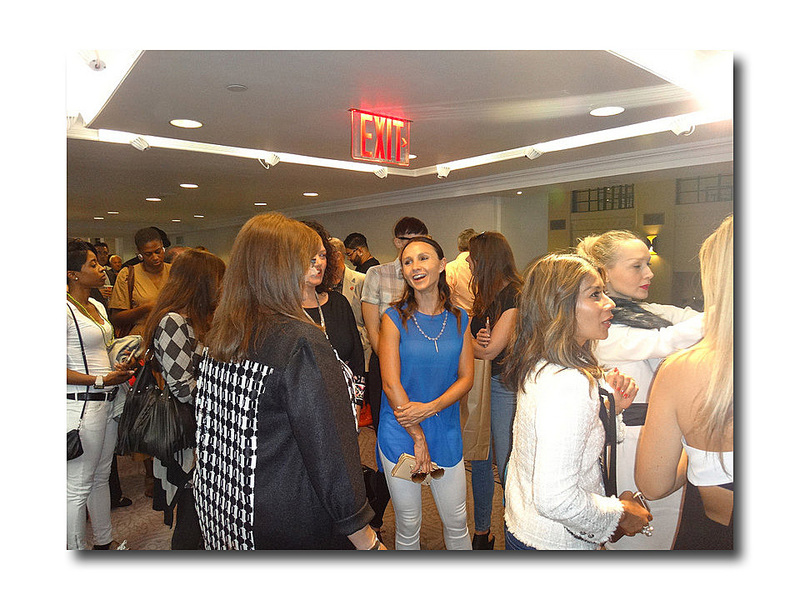 Anna Tagliabue takes her "Bow-wow-wow"
In accordance, her program notes invited guests to "search for the hidden V's for VEGAN in the design. BTW, you won't have to look too hard for her letter "P" framed by two peacocks" monogram -- it was featured prominently either as an emblem on a belt or on the back of a coat on a few select garments. Hopefully Tagliabue will not allow this branding symbol to become as ubiquitous as the supersized RL polo pony-- the quality and uniqueness of these garments can speak (or in this case, woof) for themselves. 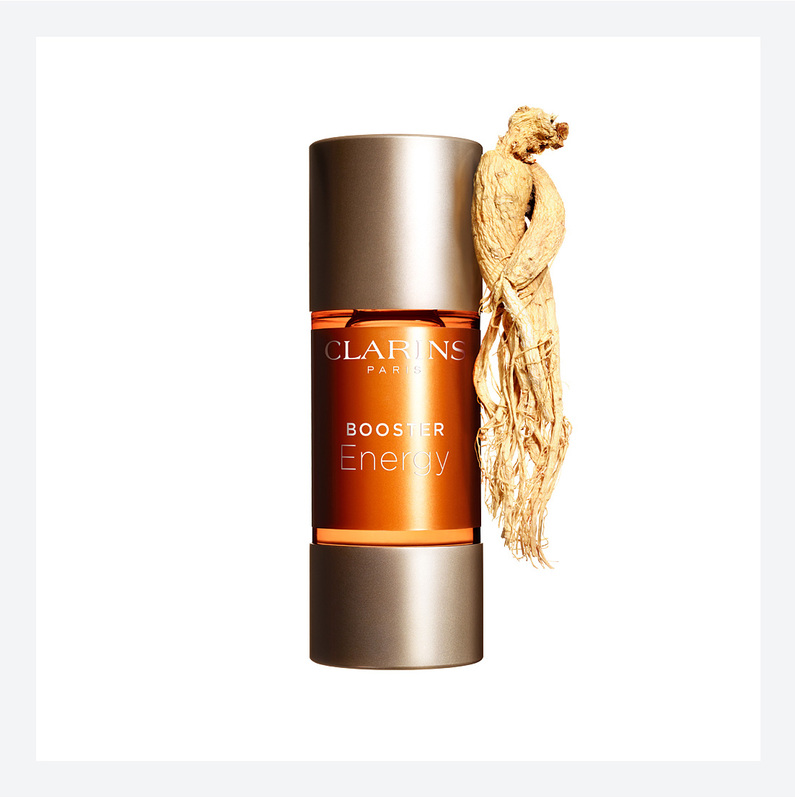 Add a few drops of Booster Energy to your moisturizer, foundation, serum or mask and see dull, fatigued skin become revived and radiant. It contains Ginseng root, which stimulates the skin to help it recover from sleepless nights, travel, stress and other aspects of a hectic lifestyle. 15 exotic botanical ingredients are combined in this gentle, rinse off oil cleanser. It leaves your skin feeling soft and smooth and helps prevent dehydrated skin and excess sebum.